Natural mineral water comes from underground, is protected from contamination and bottled directly at the source. It contains vital minerals and trace elements and makes a healthy contribution to the daily diet. The water’s composition of minerals and trace elements may differ significantly from source to source. Medicinal waters are special types of mineral waters: they are characterized by a particularly high content of minerals and have a healing and preventative health effect. Healing waters are subject to the German Federal Pharmaceutical Act and must be approved by the Federal Ministry of Health. Like mineral water, spring water is naturally pure, comes from underground reservoirs and is bottled at source. However, it contains less mineral content and trace elements than mineral water and has limited nutritional value. A bottle labeled “spring water” may contain water from different sources, and bottlers may remove iron and add or remove carbon dioxide. Table water is not a natural but a manufactured product. Regular tap water, mineral water or spring water may be mixed with ocean water or enriched with minerals or carbon dioxide. Bottled water can be produced and bottled anywhere. Tap water is basically a mixture of ground and surface water sourced from lakes or reservoirs. 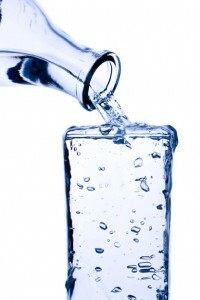 Before it can be called “drinking water,” it’s cleaned and filtered with the use of chemical additives. Chemical treatment does not eliminate all contaminants – some drug and hormone residues and nitrates are found in municipal drinking water (or sometimes in bottled water).